Rosie proudly displays her new William Floyd identification badge. 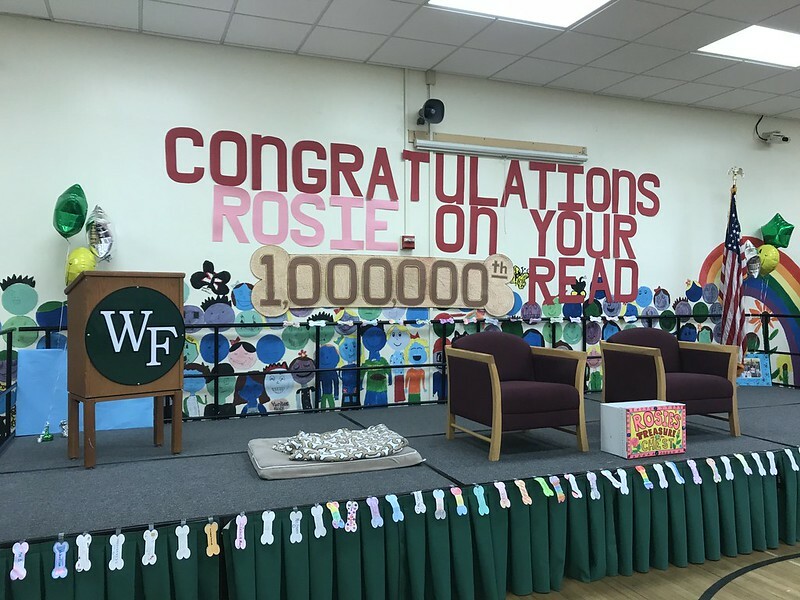 Nathaniel Woodhull Elementary School recently honored “Rosie,” a goldendoodle and trained therapy dog, and her owner, Tom Kveton, for her one millionth “read,” a feat that she has accomplished in just under 10 years by visits to schools, libraries and hospitals. Rosie first started visiting Elizabeth Caffrey’s class in 2015 and has since been visiting children weekly throughout the school year. During the ceremony, Rosie was presented with an honorary William Floyd faculty identification badge, an original book, “Rosie Goes to School” written by Principal Monica Corona, along with gifts of artwork, song, a green Nathaniel Woodhull tutu (a gift from the PTO) and a $350 donation to Therapy Dogs International. Each and every day, Rosie continues to provide a relaxed atmosphere for students to practice their reading and build their confidence. Please enjoy the album of images below along with various media coverage from the day’s event! The Rosie Song: The Nathaniel Woodhull Elementary School original “Rosie Song” performed by the Nathaniel Woodhull second- and third-grade students with music by Chris Miranda, lyrics by Sharon Kitzis and accompanied by fifth grader Joshua Crespo on the flute.